I just shared with you all the terrific news about my new find: Siete Paleo Tortillas! 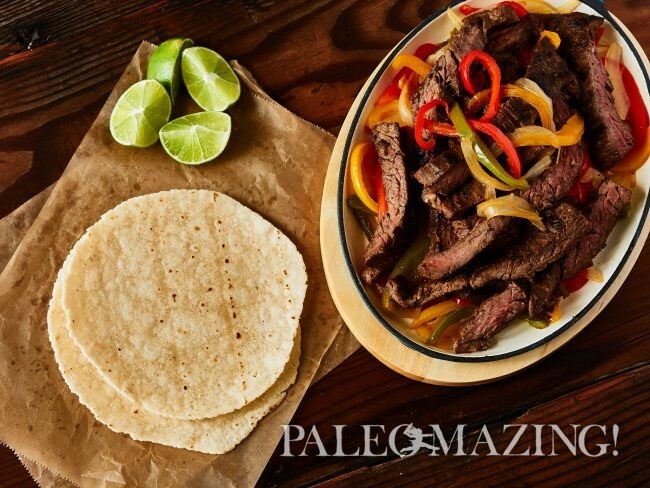 Now I bring you a banging paleo recipe, Paleo Citrus Fajitas which is the perfect introduction to an authentic Mexican recipe, direct from the Garza family recipe collection. I am so happy I met these people. Boy can they cook amazing paleo meals! My mom lived in Puerto Rico for over 30 years and I have a Puerto Rican half-brother, plus two of my three kids are literally addicted to Mexican food, so I have been surrounded by all types of Latin dishes for many years. I love it! The spices, the flavors, the heat and the passion they have while cooking and eating is something to be experienced. It is a love affair and they will invite anyone and everyone to their table. I invite you to try this delicious and totally nutritious meal with their incredible “homemade” paleo tortillas that we can all now have in our very own homes! This recipe was contributed by Siete Family Foods and is a Garza Family Recipe. Oh and if you’re feeling adventurous, treat yourself and end the meal off with my paleo twist on a classic latin dessert: paleo fried ice cream. Now I bring you a banging recipe, Paleo Citrus Fajitas which is the perfect introduction to an authentic Mexican recipe, direct from the Garza family recipe collection. I am so happy I met these people. Boy can they cook! I invite you to try this delicious and totally nutritious meal with their incredible “homemade” paleo tortillas that we can all now have in our very own homes! Add all marinade ingredients to a blender and blend to a liquid consistency. Refrigerate steak and marinade for 4 hours. Remove steak from the plastic bag and pat dry with paper towels. Cook steaks on grill for 4-5 minutes per side or on a stovetop in cast iron pan. Allow steaks to rest at least 10 minutes before slicing and serving. Heat 1 tablespoon of oil in a skillet over medium-high heat. Add peppers and onion to oil and season with salt and pepper. Cook peppers and onion, stirring occasionally, until peppers are just tender, 6-8 minutes. Heat the tortillas on a griddle for 10-15 seconds per side. Use tortillas to serve fajitas in tacos, or serve on the side. We like to use our tortillas as a fork!